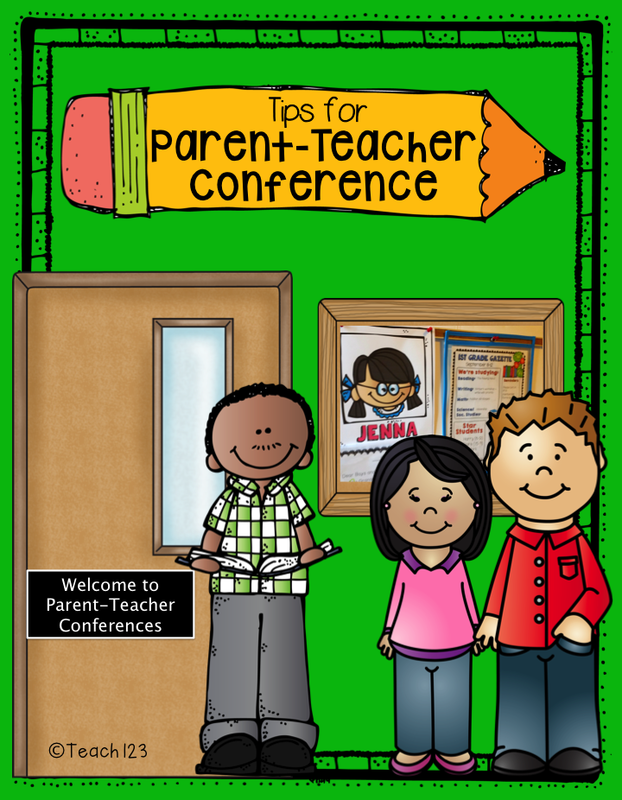 Parent-teacher conferences are an important part of teaching. The week of conferences is one of the most exhausting of the year. I often found that after all of the meetings were over, my parents and students were more engaged. It felt like we were working as a team. Even though I communicated with my parents through all the usual methods like newsletters and phone calls before we met, the face-to-face meeting is always best! The disadvantage of meeting with all of your parents at one time is having a limited amount of time to talk to parents. I have found that it helps if you send home a note like the one below before the conference. It serves as a reminder and helps the parents organize their thoughts. It also helps you prepare for your meeting. There is nothing worse than being blindsided when you are talking a parent. On the actual day of conferences, I hang a note like the one below on my door. I have found this to be the best way to keep me on schedule. Parents who are waiting are never sure whether they should knock or not. With this note, you are giving them permission. It also reminds parents that your time is limited and you are doing your best to stay on schedule. I put a student desk outside my door with a basket of candy and digital clock. 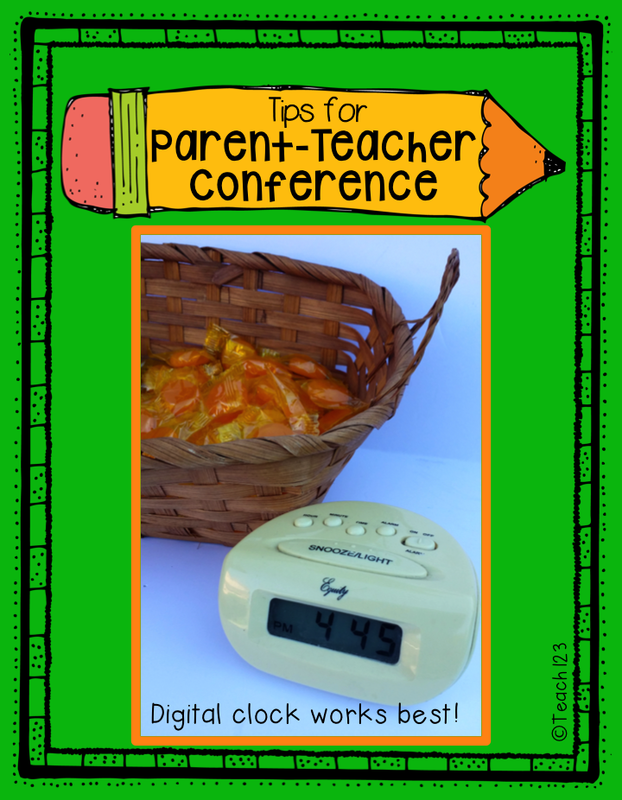 I keep another digital clock next to me on the table where I meet with parents. Different people set their clocks to a t.v. news programs or computer site which means clocks aren’t synchronized. Having these two clocks keeps everyone happy! 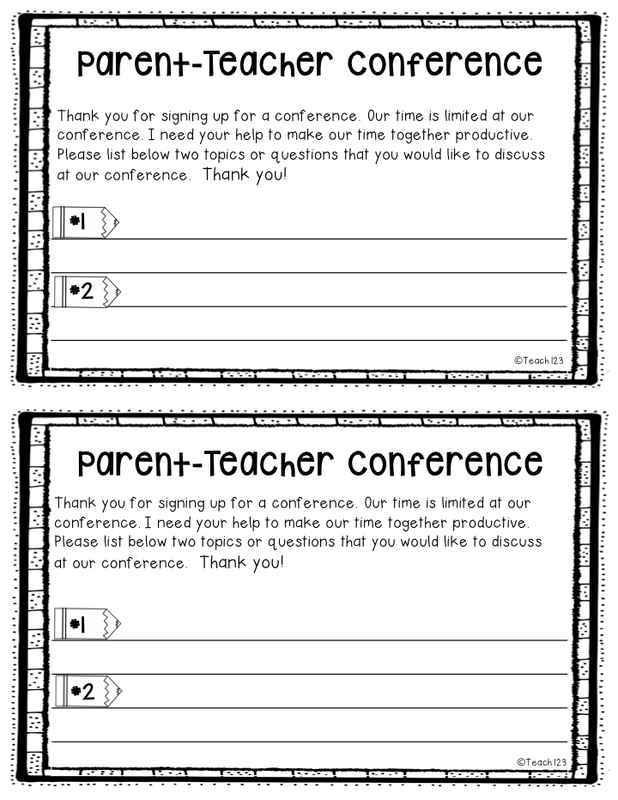 Click HERE to download these free conference printables. Looking for more tips? Check out my October Pinterest board. Click on the picture below. 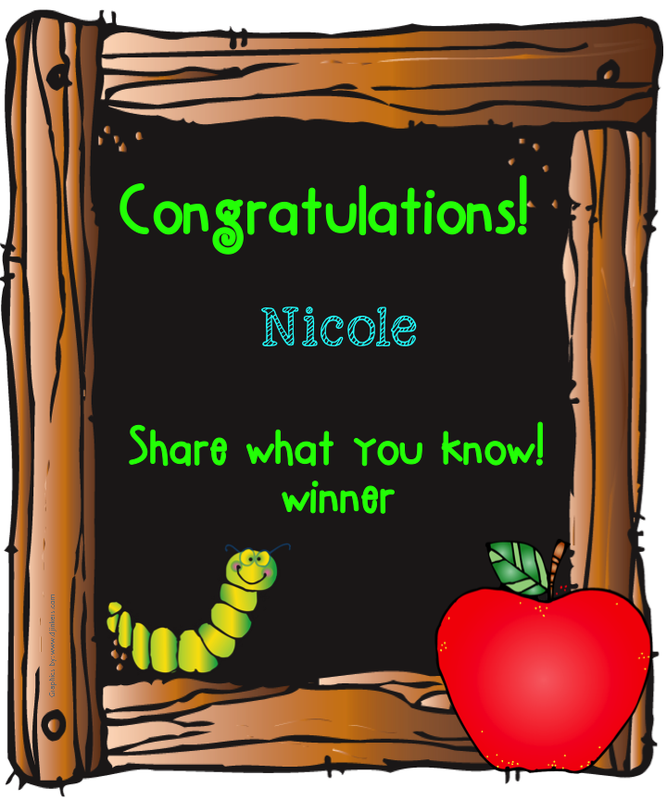 Our winner last week is Nicole. Congratulations Nicole! 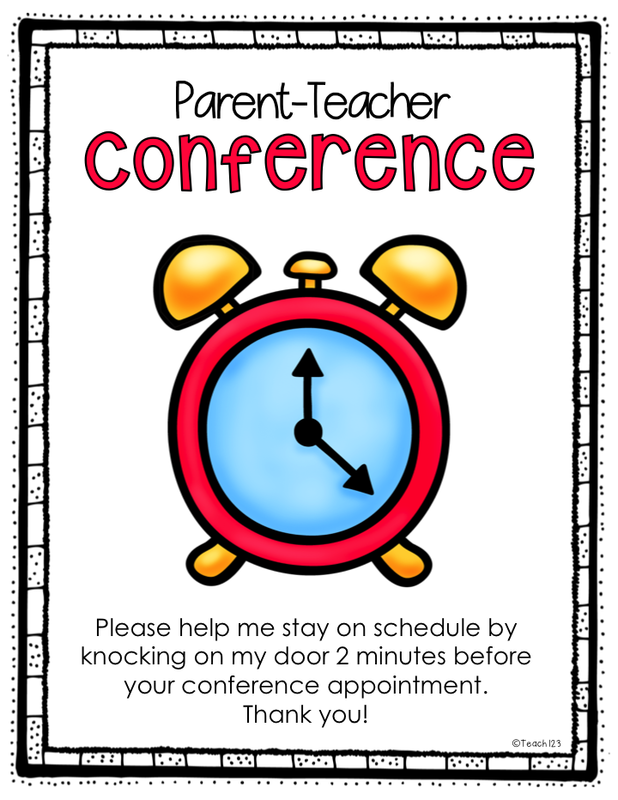 Do you have a parent-teacher conference tip to share? 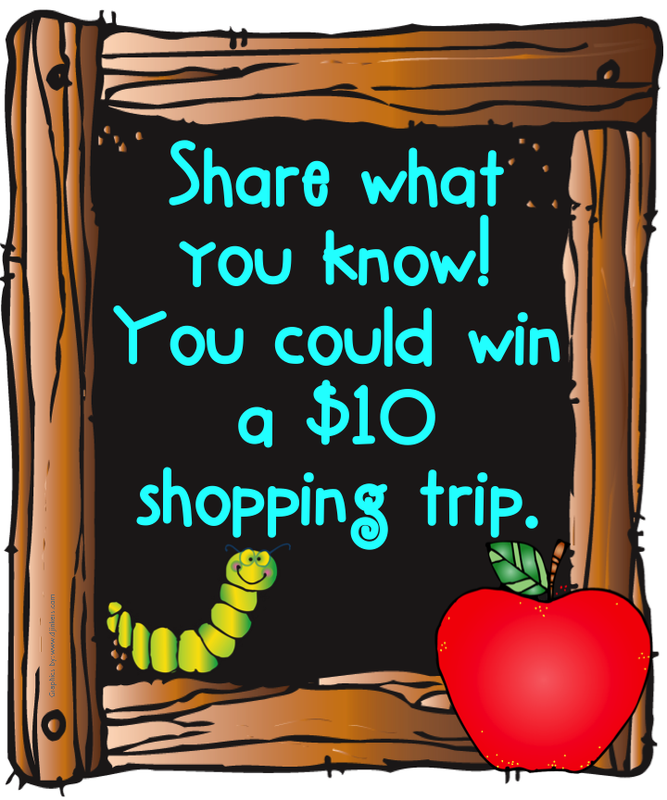 Be sure to include your email so I can contact you if you’re the winner of the $10 shopping trip. You must leave your email address in order to win. Wow! Great post. Thanks for all the great tips and freebie! I love the idea of sending the form home ahead of time for parents to fill out. It makes their concerns even more important.